Deficits and the public debt are starting to matter. Really. It is now more strikingly true than ever given the U.S. public debt-to-GDP is more than 3.4x higher than when President Reagan took office. 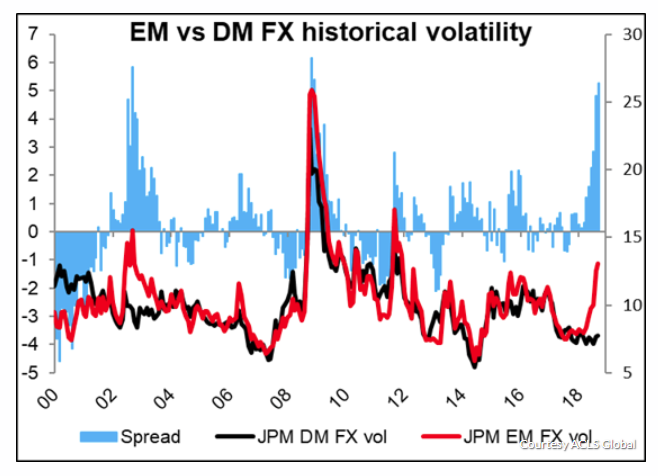 Go no further than the debacle currently taking place in the emerging markets (EM), which began in the second quarter of this year, to witness the consequences of the U.S. Treasury’s trillion-dollar-plus demand shock for global funding. In a closed financial system and a non-QE world, price (interest rates) would adjust to move the capital and debt markets back to a more sustainable equilibrium. The rise in interest rates would force the government to borrow less as higher interest rates crowd out other spending. Also, the supply of loanable funds to the government would rise as savings increase. That is not the world we now inhabit, however, where global financial repression by central banks has resulted in a “rent control” like shortage of dollar funding. 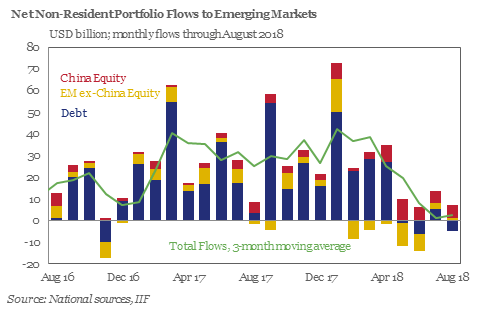 The shortfall is now being plugged, in part, by the residual capital flows, which had been chasing yield in the emerging markets over the past several years. That is the sucking sound you have heard since late April. 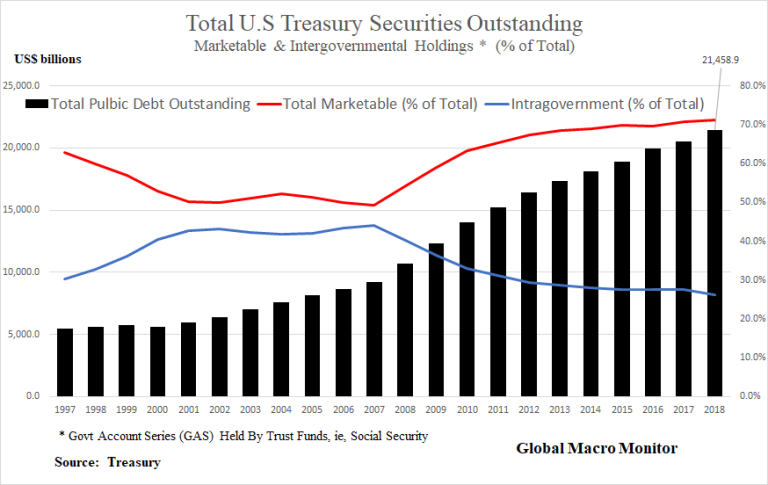 Therefore, it is no surprise, at least to us, global markets, beginning with the most vulnerable twin deficit EMs, are experiencing significant pressure from the crowding outcaused by the U.S. Treasury’s massive increase in market borrowing. The following table illustrates the Treasury borrowed close to $1 trillion from the public in the first eight months of 2018, more than a trillion dollar swing from the same period last year. Almost 85 percent of the 2018 new debt issuance was in the form of marketable securities, that is borrowing from the public markets, of which more than half was T-Bill issuance, explaining the pressure on short-end of the curve and a growing scarcity of dollars. 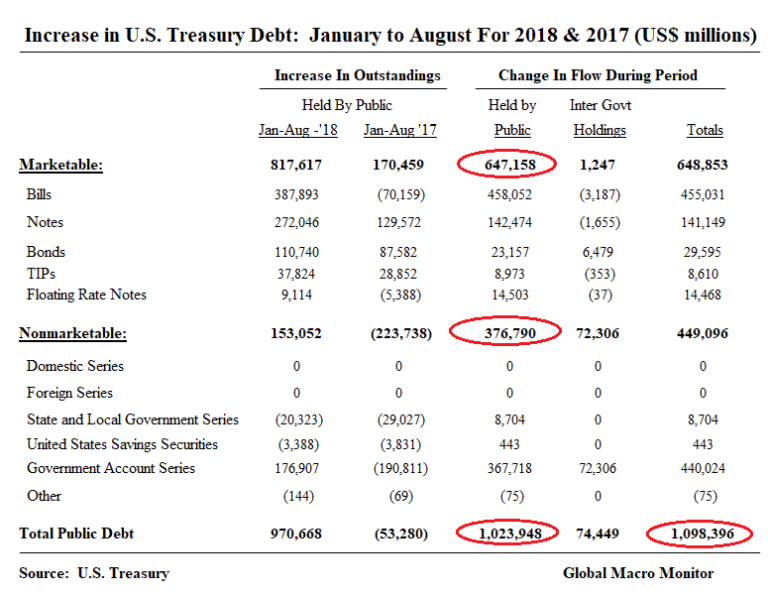 Because of the constraints on raising the debt ceiling in 2017, total net Treasury issuance to the public from January and August 2017 was a net negative. Marketable note and bond issuance did increase around $200 billion, however, probably over worries about disrupting the market and liquidity concerns. The government was financed in January to September 2017, primarily by the Treasury reducing its cash balances at the Fed and “other means of financing,” such as deferring payments to federal retirement accounts, and a game of three-card monte by shifting funds around. The spike in new debt issuance in 2018 is not only caused by the financing of a larger budget deficit due to the tax cuts and big ramp in spending, but also the rebuilding and maintaining of the Treasury’s cash balance at the Fed , and the likely reduction in obligations incurred through “other means of financing” in 2017. Furthermore, the Fed began quantitative tightening last October, starting its roll-off of the $4 trillion-plus maturing securities (SOMA) purchased during quantitative easing. Thus far, the Fed’s SOMA portfolio consisting of both Treasury and Agency Mortgage-Backed securities has declined by around $231 billion, which is not insignificant, and equivalent to 6 percent of the U.S. monetary base. The Fed’s roll-off of $145 billion in Treasury securities in the first eight months of 2018 is a hole that had to be plugged by the market, otherwise the Treasury’s cash balances held at the Fed would have declined. The Treasury cash reduction at the Fed is the liability side of the Fed’s shrinking balance sheet , which was not the case during QE where asset purchases created a corresponding liability in the form an increase in bank reserves held at the Fed. Global liquidity, in the form of base money is shrinking, but the monetary aggregates continue to grow, albeit slowly, which reflects credit is still expanding, and the continued creation of endogenous money. The term “global liquidity” is not easily defined, it is an elusive and ambiguous concept, and almost impossible to measure. We believe our analysis and framework provides a much clearer framework and more concise picture of the current global market dynamics. Nevertheless, we are always looking for indicator species of a changing global monetary ecosystem, and the emerging markets and commodities are the best we have discovered. Living next to you is in some ways is like sleeping with an elephant. No matter how friendly and even-tempered is the beast if I can call it that, one is affected by every twitch and grunt. — Pierre Trudeau. Due to the relatively large size of the U.S. economy, just a small change in its funding requirements have outsize effects on the global financial system. The table below illustrates this point. It’s relative size also makes the U.S. a price maker in the financial markets. 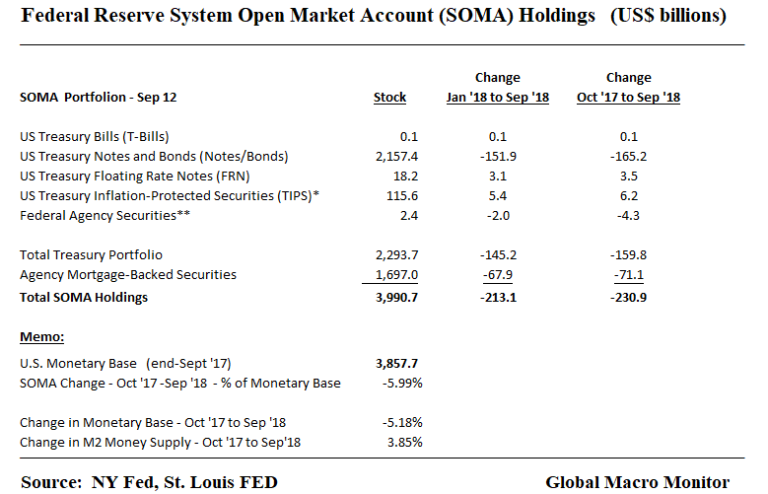 The issuance of marketable Treasury securities and the SOMA Treasury roll-off totaled $1.02 trillion in the first eight months of 2018. 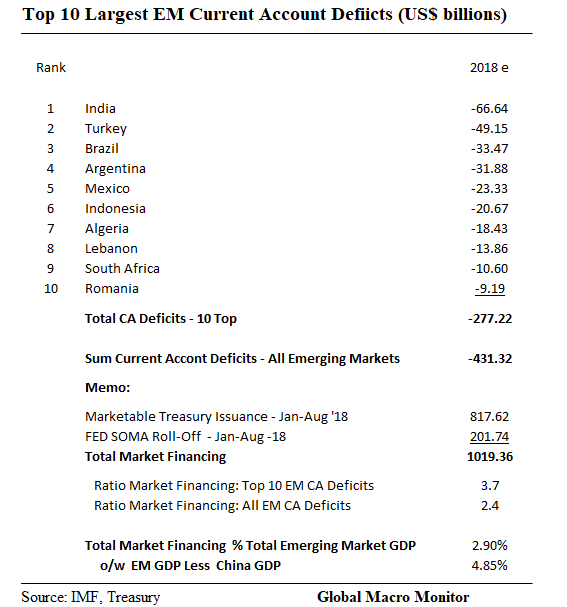 That is almost four times the sum of the ten largest 2018 estimated current account deficits in the emerging markets; 2.4 times the combined current account deficits of all emerging markets; 3.7 percent of the emerging market 2018 GDP, and almost 5 percent of the GDP of all emerging markets x/ China. Yuuge! We cannot impress enough what a significant shock to the financial markets this has been in 2018. The Treasury net take-out from the public was net-zero last year. Compare this to the first eight months of 2018, in which the U.S. G hoovered up over a trillion dollars from the markets. In the world of full-blown quantitative easing, where central banks were printing reserves to purchase government bonds (among other assets) the effects were trivial, null, nonexistent. What about now, you ask? The times they are a-changin’. Countries caught running large deficits are now having their Wile E. Coyote moment. Why Haven’t U.S. Long-Term Interest Rates Spiked? 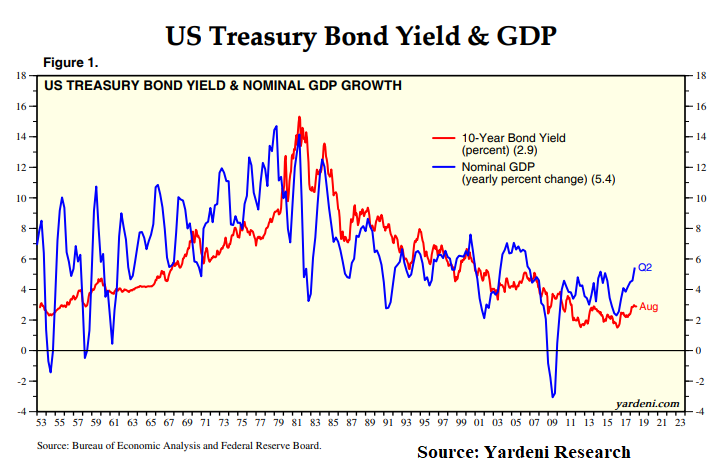 Real long-term interest rates continue to hover around zero percent, which seems absurd to us, given nominal GDP growth is running at over 6 percent. 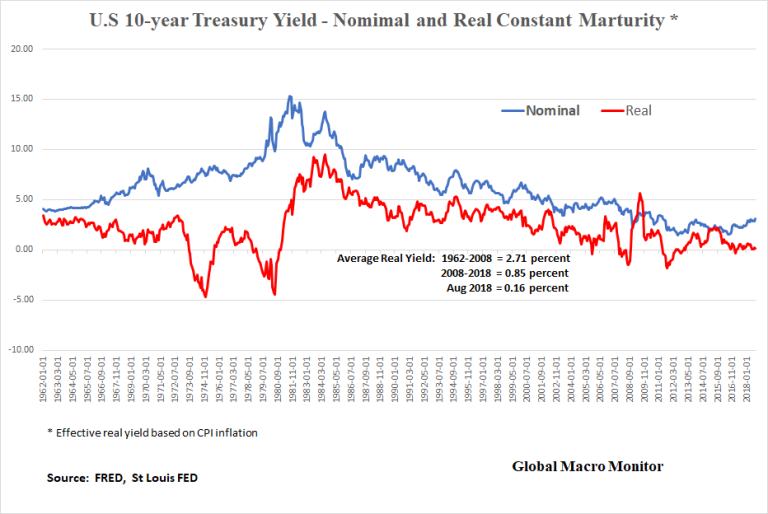 Prior to the Great Financial Crisis (GFC) the effective real interest rate on the 10-year Treasury note, measured with CPI inflation, average 2.71 percent from 1962-2008 compared to 0.85 percent during the last ten years, 2008-2018. We estimate the real rate at 0.16 percent at the end of August. Several structural factors have been distorting a “more correct” equilibrium long-term risk-free interest rate — if one exists at all — which are now beginning to fade. We counsel patience. The train has left the station. Interest rates are on the move. 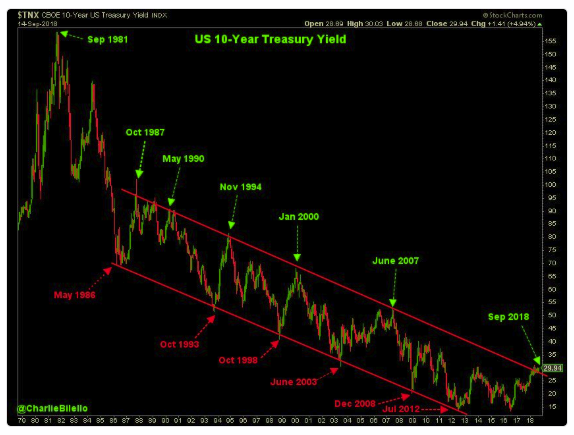 Before moving to the fading structural factors, which have held down long-term interest rates, let’s briefly take a look at the fundamental arguments for the collapse of term premia, the flat yield curve, and the low long rates. 1, Lower inflation for longer and forever. The recency bias of almost 30 years of disinflation is a hard habit to break. Cleary, this is an example of adaptive expectations, contradicting how I was trained as an economist in the school of rational expectations, which I never fully bought into, by the way. The disinflationary expectations ingrained in the market is the complete opposite of the problem of former Fed Chairman, Paul Volcker, inherited when he took over an economy in an inflationary spiral. Mr. Volker had to break the back of inflationary expectations with protracted and extremely tight monetary policy, which took short-term interest rates over 20 percent. 2. The New Economy. The new economy as we have described is more dependent on asset markets than almost anytime in the nation’s history. The fear of a bear market or big market hiccup sends the deflationistas into a tizzy. Even the term “deflation” seems to have morphed into a definition almost more closely associated with asset price declines than rising consumer prices. Economic progress appears now to be driven by this deflation/inflation dialectic. We concede this argument does deserve considerable merit. 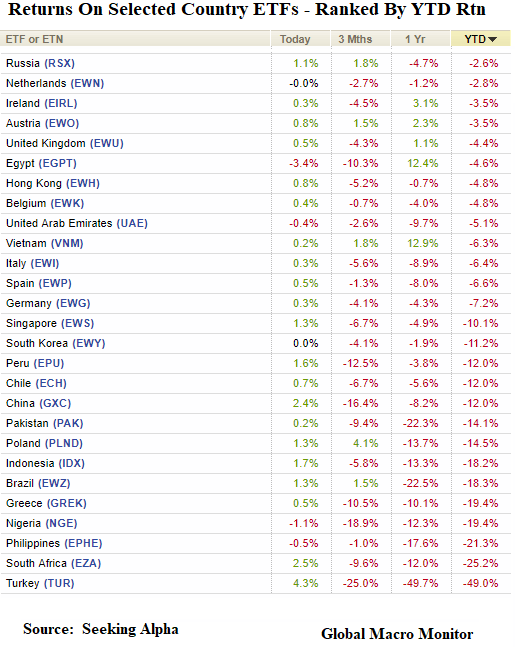 3, Negative and near-zero rates in Japan and Europe. A 10-year German bund yield of near 50 bps and a JGB yield of 13 bps are probably the strongest fundamental reason anchoring U.S. rates and holding back yields from spiking, in our opinion. Labeling the interest rates differentials as “fundamental” make us feel uncomfortable as we believe it is more of a technical issue. Nonetheless, even these rates are beginning to move higher. By this time next year, we fully expect that the European bond market bubble to have fully popped. We reject the thesis global bond yields, including the U.S 10-year note, are driven by fundamentals. Measuring inflationary expectations based on interest rates, which are thoroughly distorted by the technicals of QE, is a fundamentally flawed proposition. The economic signals from the bond markets have been rendered null and void by the central banks. ‘Nuff said. Let’s move on. All of Washington, including even Tea Party fiscal conservatives, appear to have abandoned any semblance of fiscal discipline. The budget deficit rose by a third in the October to August period from $674 billion in the same timeframe a year earlier, the Treasury Department said in a statement on Thursday. The following table is an estimate of the Treasury’s financing needs over the next five years. We don’t put much faith in the accuracy of long-term economic projections. Politics can change, and policies will change. The economic situation could go sideways causing a crisis. They do, however, provide a framework, a basis for analysis, and usually get the direction and zip code correct. What is clear, however, the Treasury will tap the markets for its trillion-dollar-plus funding needs for as far as the eye can see. The deficit projections are taken from the CBO and OMB and have converted fiscal into calendar years. A small portion of the deficit financing will come from borrowing from government trust and pension funds, taking a smidgen of pressure off the markets. We are confident in our estimates of the SOMA Treasury roll-off. The only uncertainty is the final size of the Fed’s post-GFC balance sheet and whether the Treasury maintains a consistent cash balance at the Fed. That is when the Fed will end quantitative tightening. 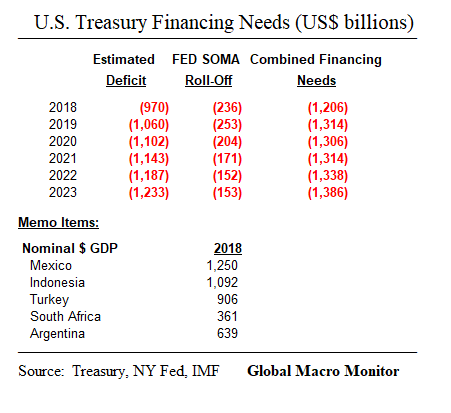 The combined annual financing needs of the Treasury over the next several years are large and will exceed the GDPs of even some of the largest emerging market economies. It surprised us that. the traditional fiscal conservative Republicans, at least in rhetoric, chose to implement a procyclical fiscal policy. Speaker Paul Ryan used to warn the U.S. was the next Greece if it didn’t get its fiscal house in order. “Next year, the United States could be like Greece,” Sessions continued, referring to the severe debt crisis faced by that country as a result of uncontrolled government spending. The procyclical tax cuts and spending ramp goosed an already real trending economy, causing growth to accelerate, but it was rare, nonetheless, for the U.S. or any developed economy. If the larger deficits trigger an adverse market reaction, policymakers may be forced to implement procyclical policies during a downturn. 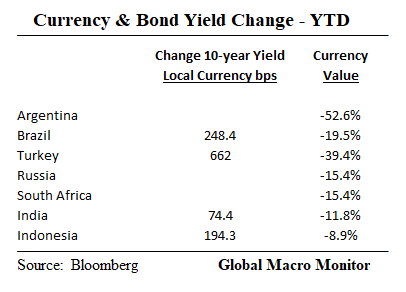 Just as the markets are forcing the EM countries that have been hard hit this year to do — i.e., raising taxes and cutting spending during in an economic downturn. The net result of the higher deficits will be more crowding out in the global financial markets and pressure on long-term interest rates to move significantly higher. We constructed the following chart to illustrate the schedule of maturing Treasury securities by month, held in the Fed’s September 12th SOMA portfolio. 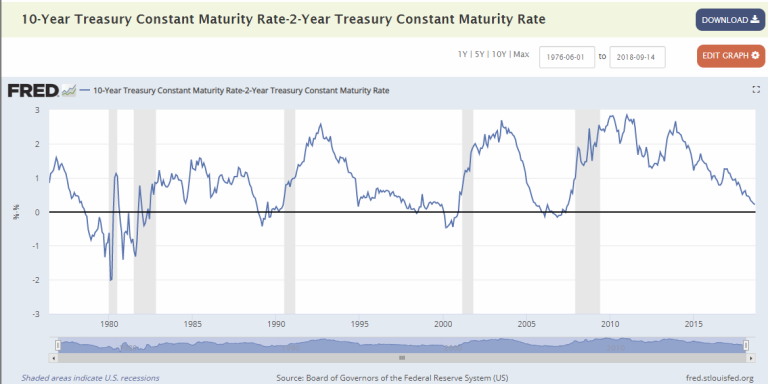 In the current month of September, for example, $19 billion of Treasury securities mature, but the total falls below the $24 billion monthly quantitative tightening cap (purple line) leaving zero SOMA cash available to reinvest and participate in the Treasury auctions. The $19 billion will not be reinvested and is reflected in the red bar. The Treasury will be forced to plug the gap with new market borrowings or rundown its cash balances at the Fed. The same dynamics hold for the roll-off of the SOMA MBS portfolio, where the cash balances at the Fed of government-sponsored enterprises (GSEs) are reduced when mortgages run-off and not reinvested. 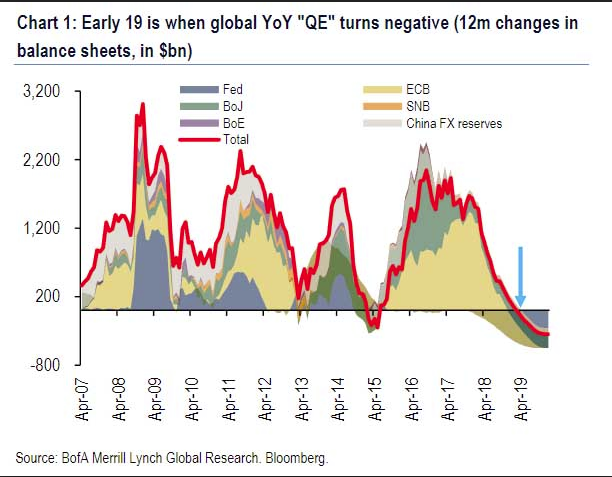 We need to think more about this but our first impression is the economic effects of quantitative easing, and quantitative tightening are not symmetric. Because of the difference on the liability side, QT appears that it will be more direct, more onerous than expected, and quicker in its economic impact than QE. Moreover, QE enabled the government to issue the debt it now has to pay back to the Fed or forced to issue more marketable debt. QE has really blurred the lines between fiscal and monetary policy. September will be the first month in several years where the SOMA will not participate in any of the notes, bond, FRN, or TIPs auctions. 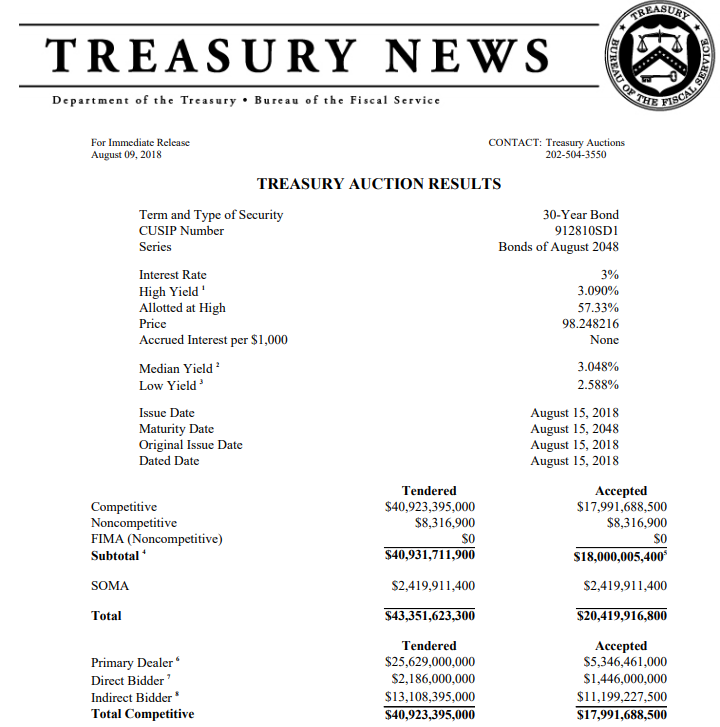 The same holds for October, when the QT cap steps up to $30 billion per month, as $24 billion of Treasuries mature. 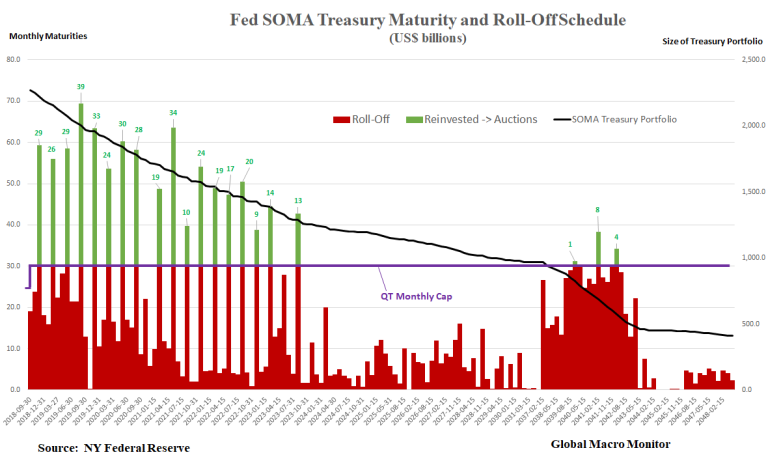 In November, $59 billion of SOMA Treasuries mature, of which $30 billion (the QT cap) will not be rolled over (red bar) and drained from the financial system, with the remaining $29 billion (green bar) in cash used as noncompetitive bids in the variety of notes, bonds, FRN, and TIP auctions. The black line illustrates the decrease in the SOMA Treasury portfolio over time as securities roll-off. Some argue that the stock of excess reserves are declining too fast, down 18 percent since QT began causing the Fed Funds rate to consistently trade at the top of the 25 bps target range. Consequently, the Fed will be forced to end its balance sheet reduction sooner than the markets think. A plausible scenario. However, why not just stop paying or further reduce the interest rate on excess reserves (IOER), which will force reserves back into the Fed Funds market putting downward pressure on the rate? If we had to guess, QT ends in June 2022 when the SOMA Treasury portfolio hits $1.5 trillion and the MBS portfolio around $1 trillion. We suspect, however, the glass will begin shattering long before then, forcing the Fed to reverse course. 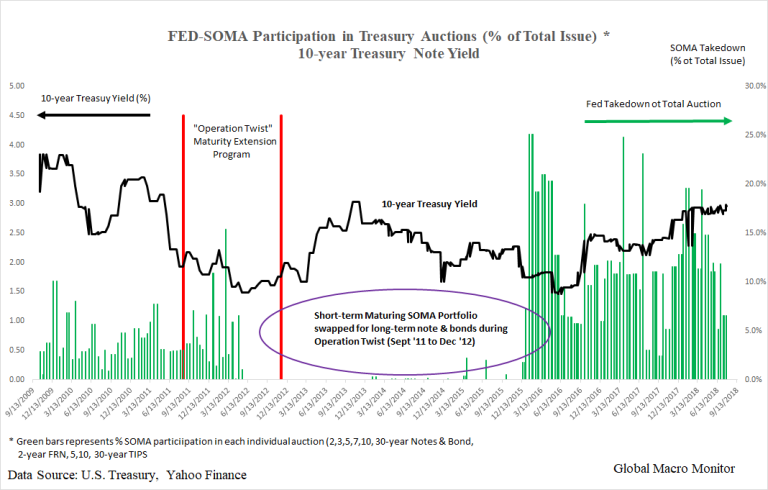 Our next chart illustrates the SOMA participation in every Treasury auction since September 2009, which was financed by the sum of its maturing securities during each particular month. The green bars represent the SOMA percentage takedown of the total amount of securities issued during the auctions and the black line is the corresponding 10-year Treasury yield on the date of each auction. The Fed engaged in “Operation Twist” between September 2011 and December 2012 (two red bars) to bring down long-term rates. It sold shorter-term securities in its portfolio to purchase long-term Treasuries. It appears just anticipation of the program reduced yields as traders began front-running the Fed. Interest rates began to spike as soon as the SOMA ran out of maturing securities and stopped participating in the auctions. That is what concerns us now. The SOMA’s participation in auctions going forward will be sporadic, at best, which will likely put upward pressure on rates and further crowding out borrowers as the Treasury is forced to issue more marketable securities. The following is the Treasury press release of the results from the August 30-year bond auction. Notice the SOMA took down almost 12 percent of the total outstanding bonds issued. 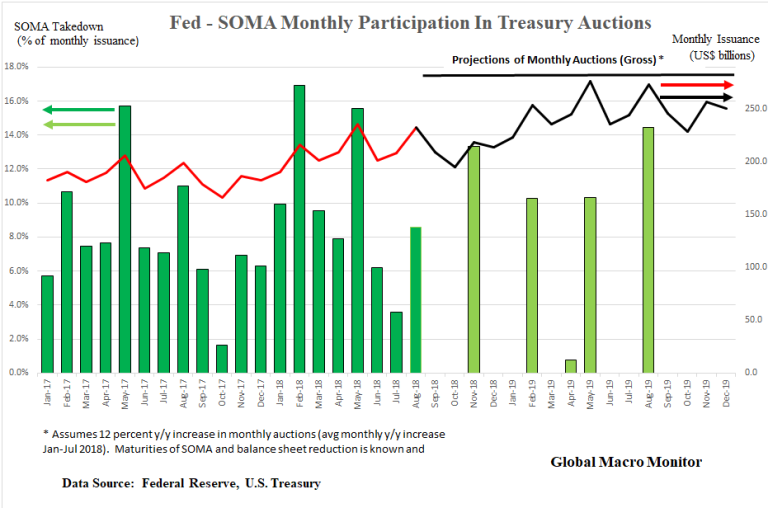 Our next chart shows the recent past and future SOMA participation in the Treasury auctions through 2019. The key takeaway here is that the SOMA will be active in the auctions in only five of the next 16 months. We believe the bond market has not fully focused on the diminishing participation of the SOMA in the auctions going forward. It now has the data and should be on traders’ radar, causing upward pressure on long-term interest rates. We promised that we would get you the piece by the end of Friday. As you’ve noticed, the post is very long and comprehensive. The final post is not yet finished but we will leave you with part one and the charts to the rest of piece. We are traveling on Friday. Check in with us on Monday for the GUT final product. No more free ride borrowing from the Social Security Trust Funds as the program is now running a structural deficit. 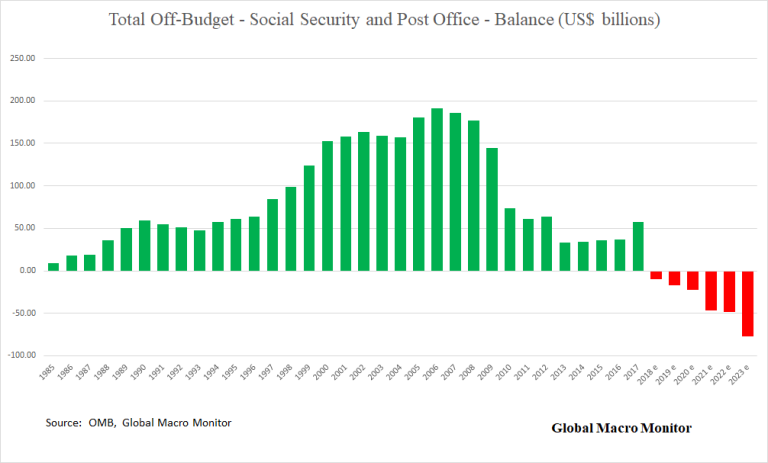 Social Security has been running a primary deficit since the GFC. Marketable debt is increasing in proportion to the total debt. The U.S. has been highly dependent on foreign savings to finance its budget deficits.